How to Change PDF Layout for PDF Printing? Let me guess the way you print PDF files. Generally speaking, the only way for printing PDF is to print it as the same size as the orginal PDF document. However, there are times that we have to print a large amount of PDF files (say hundreds of pages for a PDF novel) at one time or print multiple pages on one PDF sheet. In this circumstance, what should we do? Print them one by one although it takes time and wastes paper? You can no longer worry about this issue, because to change print layout for PDF is not so difficult. You can easily print multiple pages on a PDF document sheet. And PDF Merger is the right PDF tool that offers flexible PDF layout settings for PDF printing. With PDF Merger, you have the options to choose your ideal output PDF layout. This function is unique comparing to the similar PDF freeware tools. Even compared to some paid PDF merger programs, PDFMate PDF Merger is still competitive. PDF Merger offers two main PDF layout options: one is choosing output PDF printing size as A5, A4 and A3; and the other is choosing output PDF layout design as 1IN1, 2IN1, and 4IN1. In order to print multiple PDF files into one PDF and make a change to the print layout of PDF file, you need to download PDF Merger first. PDF Merger is a totally free PDF tool that contains NO spyware, NO malware, No shareware, NO toolbar. You can feel easy to download PDFMate PDF program. Click "Add Files" button to add the files that you want to make a layout design for PDF printing. You are free to input PDF files, scans of document or images to PDF Merger. Furthermore, you are able to select the exact page or specify the page range of a file to convert. After adding the files and choosing the pages that you want to convert, it is time for you to set the output PDF layout. You are free to choose the output print PDF file size from A5, A4 to A3. 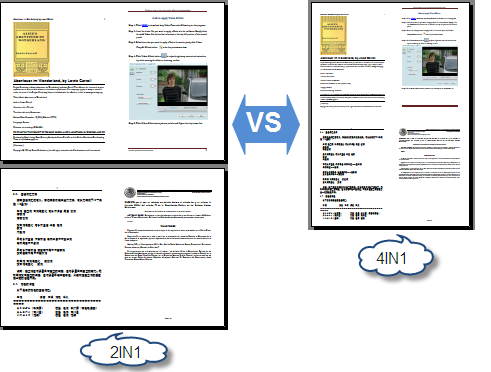 At the same time, choose the PDF layout design as 1IN1, 2IN1 or 4IN1. Finished setting print laypout for PDF printing, click "Build" button to start forming a new PDF file. The whole process just takes seconds. This is an example of the formed PDF by choosing different print layout. Save paper, save money, save time! This is what PDF Merger can do for you. By changing the PDF layout, you turn big files into a smaller PDF file, save paper when printing PDF and get the ideal part in one PDF file easily. Most importanly, all the print layout settings has no influence on the quality and the design of original file.